King's Guilbert Francois and Greens Farms' Patrick O'Brien in action as King hosts Greens Farms Academy in a boys basketball game in Stamford, Conn., February 6, 2012. 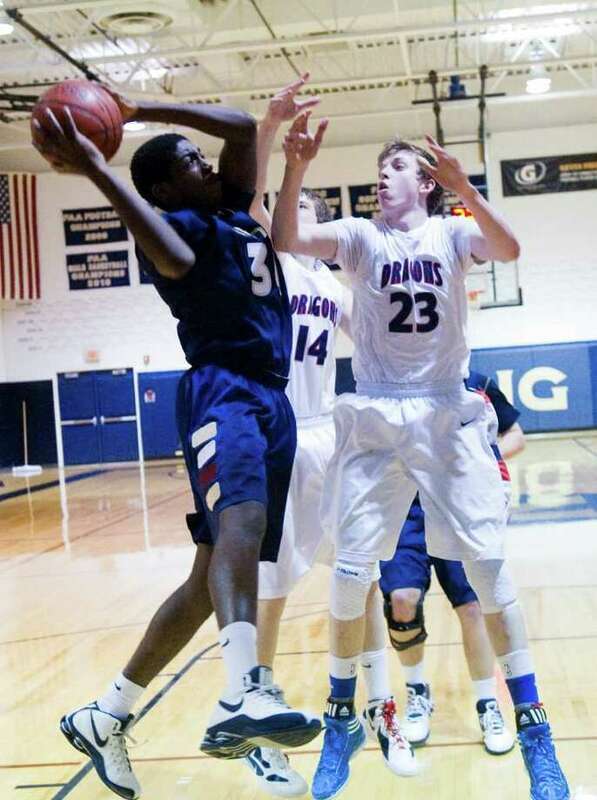 STAMFORD -- The first time that the King School boys basketball team met Fairchester Athletic Association rival Greens Farms Academy, King took the powerful Dragons to overtime before losing. GFA wasn't interested in creating that much drama in Monday night's rematch at King's gymnasium. The Dragons were on fire from the 3-point arc and rolled to a businesslike 66-51 triumph. For GFA (14-3 overall, 10-3 FAA), it was the Dragons' school-record 11th consecutive victory and allowed them to solidify their hold on second place in the FAA standings behind leader Hamden Hall (8-1). "The 11-game win streak has been great. It's the longest in GFA boys basketball history," said GFA guard Hunter Eggers. "We couldn't feel better with how we're playing." In the first meeting with King, GFA's 6-foot-9 center Sean Obi (29 points, 26 rebounds) was the dominant force. On Monday night, GFA proved they are more than a one-man show. Obi finished with 11 points including a trio of hoops at the rim. But he sat out nearly eight minutes in the first half with foul trouble and seven minutes in the second half due to the Dragons' big lead. Stepping into the spotlight was Eggers. The 6-foot-0 junior scored 22 of his points in the first half including six 3-pointers. "Sean's presence means everything to us. The defense just vacuums in on Sean. He passes so well it creates opportunities for all of us," Eggers said. "I had been injured for a week (missed three games, sprained foot) and just got back to practice on Sunday. "So I was ready to let it fly tonight." Most of Eggers' trifectas came during a 19-6 GFA surge with Obi sitting that made it 40-22 with 2:10 left until intermission. GFA led 47-28 at halftime. "Sometimes a coach game plans too much," said King head coach Greg Dobbs. "We really focused on stopping Obi this time. When they shoot 7-for-11 on 3-pointers in the first half, it's tough. They have so many weapons." Patrick Ryan scored nine points followed by Brien Comey (eight) and Matt Tate (seven) for GFA. GFA was without its 7th grade sensation Tremont Waters. King (7-12, 3-8 FAA) was paced by Chris Gaynor (16 points) and Matt Reggina (11). Both players fought foul trouble and Reggina had an unlucky evening on the perimeter with many jump shots going in and out. King's latest 1,000-point scorer, senior guard Drew Sawyer was held to 10 points as Obi's presence in the lane stopped a lot of penetration. King center Guilbert Francois collected eight points, nine rebounds and five blocks and was very aggressive in the second half. "The frustration is we've competed nearly every game. We need our big three to score a lot," Dobbs said. "The reality is that the FAA is a very strong league top to bottom. We hope we can make some noise down the stretch and in the playoffs." Contact Advocate staff writer Rich DePreta at 203-964-2275. Sean Obi 5 1-2 11 Brien Comey 4 0-0 8 Hunter Eggers 9 2-2 26 Matt Tate 2 3-8 7 Patrick Ryan 3 2-2 9 Zach Baines 2 0-0 4 Kam Mickens 0 1-2 1 Will Pavlis 0 0-0 0 Van Barnet 0 0-0 0 Wills Rooney 0 0-0 0. Totals: 25 9-16 66. Drew Sawyer 3 4-6 10 Matt Reggina 3 3-4 11 Chris Gaynor 6 2-3 16 Nick Della Jacono 1 0-0 2 Guilbert Francois 3 2-4 8 Desmond Hague 1 0-0 2 Connor Harris 1 0-0 2 Eddie Meizels 0 0-0 0 Mike Correa 0 0-0 0 Anthony Spadaccini 0 0-0 0 Chris Massucco 0 0-0 0. Totals: 18 11-17 51. 3-Pointers: GFA -- Eggers 6, Ryan. K -- Reggina 2, Gaynor 2.